Let’s face it, it’s tough to get a good job in the highly competitive golf industry. At GolfSurfin.com, I’m always preaching that candidates need to stand-out, do something different, take a different tack when applying to jobs. 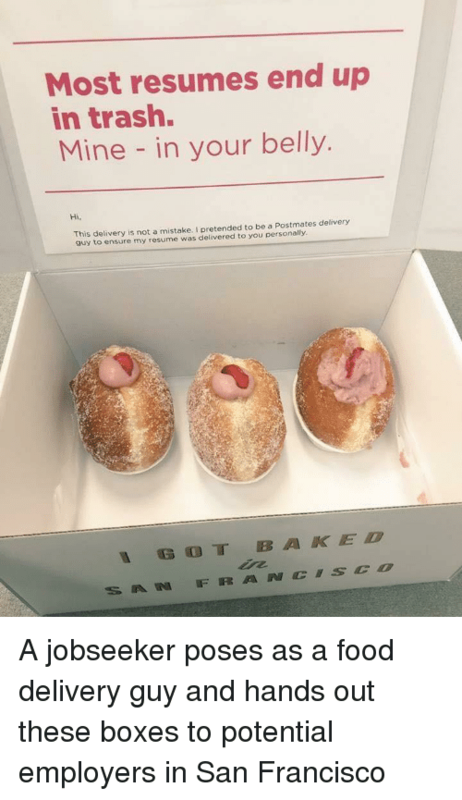 A few years back a new young transplant from Lithuania named Lukas Yla was seeking a marketing gig in Silicon Valley, another nasty competitive industry full of talent. 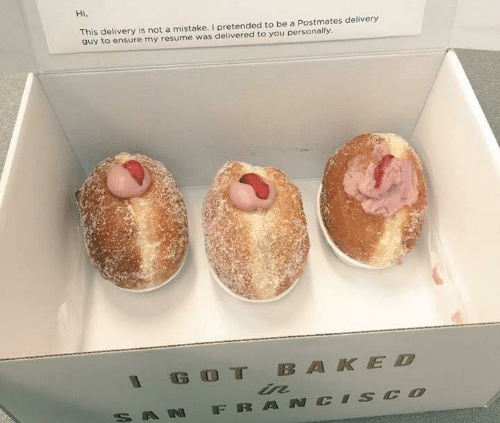 Lukas got real creative by dressing-up as a Postmates delivery guy and delivered boxes of Mr. Holmes Bakehouse doughnuts to some of the biggest Bay Area tech companies like Lyft, Uber, Instacart and Postmates with a pitch: give him a job. He scored over 10 interviews with the companies and ad agencies. According to Yla “People appreciate this approach. They understand that it requires time, creativity and a hustler attitude”. This approach may be a bit too extreme or gimmicky for you (I for one think its pretty ballsy) but this story does make the point that creativity is rewarded for those bold enough to be different. Not everyone has to dress-up as imposter to get her/his foot in the door. There are various ways to make a good impression during the job application process. One way is to use the easiest, most cost effective job seeking tool in the industry called GolfSurfin.com’s “White Glove” service. Through White Glove your quick-read headline will highlight your unique qualities and great benefits you will bring to the table and send it directly to hiring managers, HR executives and golf company owners. We’ll help present the best “you” possible in a timely, profession and honest manner at a price that won’t break the bank. Want more details? Click here to get started. https://home.golfsurfin.com/wp-content/uploads/2019/04/most-resumes-end-up-in-trash-mine-in-your-41688174.png 865 500 Dawn Schlesinger http://home.golfsurfin.com/wp-content/uploads/2017/10/logo-2.png Dawn Schlesinger2019-04-08 14:58:052019-04-08 14:58:05What's donuts got to do with resume?